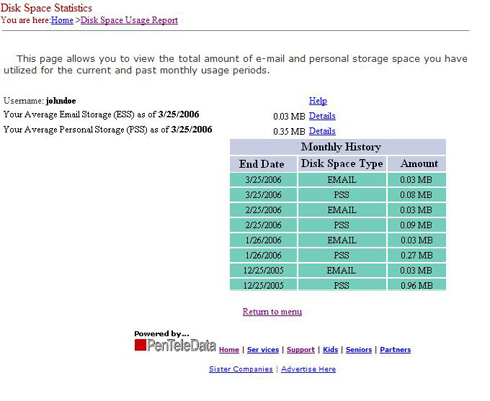 This page will assist you in accessing and using the PenTeleData "Disk Space Statistics" web page and the "Disk Space Usage Report." The "Disk Space Usage Report" will allow you to monitor your disk space usage for both your "Email Storage Space" and "Personal Storage Space." To access the "Disk Space Usage Report" webpage, you must first log into the PenTeleData "Account Management" page by surfing to ptd.net and clicking on "Account Management" on the right side of the page. After you have logged in, click on "Disk Space Usage Report" to view a report of your disk space usage. Below is an example of the "Disk Space Usage Report" web page. Explanations for each item within the report are displayed at the end of this document. Username: This field displays the account username that this report pertains to. This username could be your standard Full Access login (Dial-up, cable modem, and DSL) or "Mail-Me" account. Average Email Storage: This is the average amount of data, in MB (megabytes), which your email messages occupied on our server for the current monthly billing period. Average Personal Storage (PSS): This is the average amount of data, in megabytes, which your personal web pages, eBay images, or other FTP items occupied on our server for the current monthly billing period. By looking at the example "Disk Space Usage" report shown above, you can see that the user "johndoe" has averaged 0.03 MB of email storage and .35 MB of personal storage for this billing period. If you click on the "Details" link after the amount, you will receive a daily report for that particular disk storage over the current billing period. If you have any questions about this report which were not covered here, please contact our Customer Service Department.